February 3 offered the perfect weather conditions for the annual weather balloon in 8th grade Conceptual Physics. 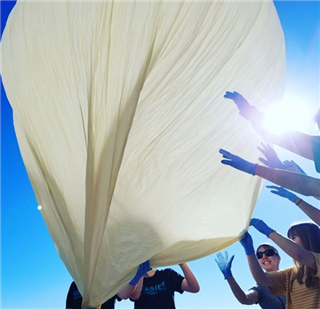 Students designed scientific experiments to study the impact of high altitude, temperature, pressure, radiation and light intensity, plotted flight paths using balloon flight modeling software, and set up an onboard GPS and live stream to broadcast the entire process. The balloon expanded as it rose, reaching 78,000 feet before exploding, sending the experiments parachuting to the Imperial Valley floor. The weather balloon required a flight plan with the Federal Aviation Administration and managed to fly three times higher than a commercial jet!